WELCOME TO ART FOR PEACE AND HEALING. We are proud to showcase our current monthly Collection by our GICAS members around the World…, OUR AIMS ARE TO LOOK FOR NEW CHALLENGES.., NEW IDEAS.., NEW GOALS for our ARTs. We welcome new members to join us! An introduction to our global Art for PEACE AND HEALING. In July 2013 we began discussion as organisation to look at ideas how to increase our creativity. I shared my experience of meditation for over 35 years that help me develop my own creativity. We therefore look to put together a date for Global meditation for one day. This lead to celebrating our first anniversary by declaring 25th August 2013 as our WORLD MEDITATION for PEACE. The success of one day meditation grew to now doing our practise on every last Sunday of each month. WORLD MEDITATION for PEACE & HEALING DAY. We proudly announce the launch of our New program that will compliment our monthly meditation with ART for PEACE AND HEALING. Each month members of GICAS, Friends and guests will be invited to submit work for our online monthly picture gallery. WE need to communicate more in one global Peaceful language that is Art .we need to express our good energy in Art in contributing a world of peace and love.Art is always giving is always caring and uniting. I agree. We are Light-workers. Through our work we can help others to consider Peace and Brotherhood for all Humanity. As a Naïve painter and as illustrator for children books I feel that if I show children and other people our Art with humor ,Naive and relaxed pictures maybe mixed with relaxed music , it will do the work. Also we can make copies of small happy pictures for children so they can paint and fill it with beautiful bright colors . When people are in stress , a simple work can makes them so happy! . – Hello Randa thank you for your entry of comments and yes we need to operate on a united front where we could accomplish greater opportunities for all involved plus send a strong message of loving and kindness that slowly we are beginning to loose it.., Perhaps if we all make that EXTRA conscious effort to express LOVE and KINDNESS in our life’s and in our ART we could work towards reversing what has been lost in our daily life. – Bette very true here too!!! Meditation is an education. Impeccable practice of meditation certainly/possibly conserves ‘creative’ minds in peaceful and spirited positions and such conditions usually support artists’ creative activities perfect and successful. Professional mediators are not so ‘creative’ too! Pushkin welcome to our Meditation lounge, here is were we begin our practise to a techniques that goes back over 4600 years. As artists and as craftsman we can relate to it like learning our skill to paint and draw the more we begin to work and practise …, the better we become. Lots of books and teaches of meditation describe it as our inner or inward journey. I call it an opportunity to go into our quieter self, or we could analysis it as a doorway to the source where all our thoughts begins or originates. WE are privilege today to have the abilities to read through records of scientific proof that has been research and experiments carried out in the last fifty years show that through mans full life we only use 20% of our brain capacity the rest remains domain. The question I’ll leave each one of think about is what would you do if you had the opportunity to tap into the other 80%? My work is often influenced by my emotions at the time of painting. 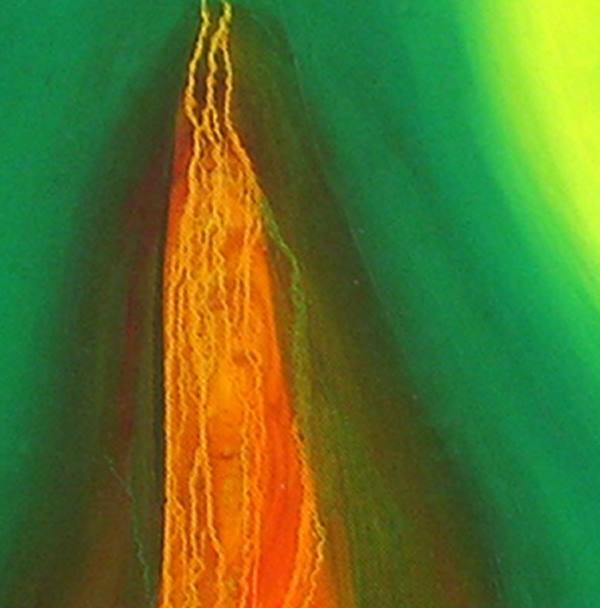 Personal experiences or those of others are evident within many of my works. I often enter my studio with no perceived conceptions of what I will paint and work at a subconscious level, with no vision of the finished product. Although I haven’t practised meditation I do believe that creativity could indeed be increased by such practises. 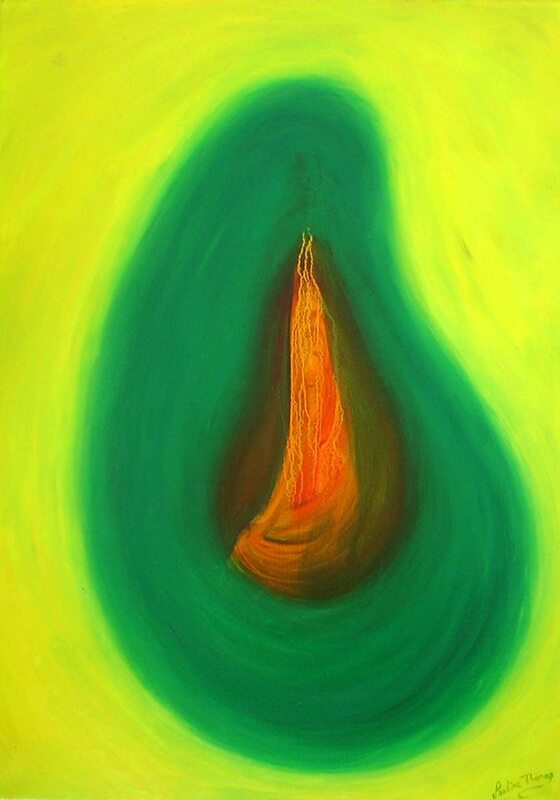 I attach an example where my subconscious highly influenced my painting Embryonic. Meditation is a word that we choose to use in describing our practise today, but similarly to your method that you put faith in reaching out with a frame of mind-set seeking for hope beyond the end of the tunnel that made you feel free and at peace with yourself, is another form of meditation. We can also see the powerful energy in your ART reflecting strength at the same time provide healing and it was no coincidence that professor Tu Shi-Ming contact you at the time as I am sure it has help all those in need of support and comfort. Taping the hidden 80% brain capacity of the humans is a theory because of the human ‘physique’. The nature has been modified the existing human physique to use his/her 20% brain capacity. For example, I want a whole week to complete one 6ft X 6ft figurative painting on a canvas. And if I can tap my hidden 80% brain capacity, maybe I can create thousands of imaginations for paintings during that one week period but I cannot materialise all those imaginations on canvases because of my physique has not changed or tuned to such enormous activity. This will looks as installing a diesel locomotive engine to an ordinary car. Now, the nature is too worried about her mistake to allow humans to tap the present 20% of their brain capacity because the current 20% has already made terrific impacts against her own survival too. Hello to Pushkin welcome back to our meditation lounge and thank you for adding your comments all useful to continue our conversation in search for answers.